The Rhyno Series from Chloride is designed for industrial and harsh environment emergency lighting needs. Following the tradition of superior product design and manufacturing, A 120/277 dual voltage input with surge protection and Intelli-Charge for self-diagnostics allows the device to serve as an emergency lighting unit. Self-diagnostics continuously monitor all critical functions of the unit, and the self-testing option meets the monthly periodic testing requirements in NFPA 101 and the IBC. 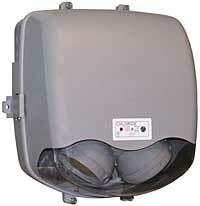 The Rhyno Series is available in 6-, 12-, and 24-volt, 25 to 100 watts. The housing is constructed of impact-resistant Lexan with corrosion-resistant hardware. A onepiece, molded gasket and unexposed metallic hardware prolong product life in highly corrosive areas. Illumination is accomplished with two lamp heads internally mounted on the bottom for optimum path of egress lighting. The lamps are held in a molded swivel assembly and are fully adjustable. The Rhyno Series is supplied standard with a wall mount bracket, but can be column, pole, or I-beam mounted with a universal mounting kit accessory.